The heart of City West beats at Breitscheidplatz. 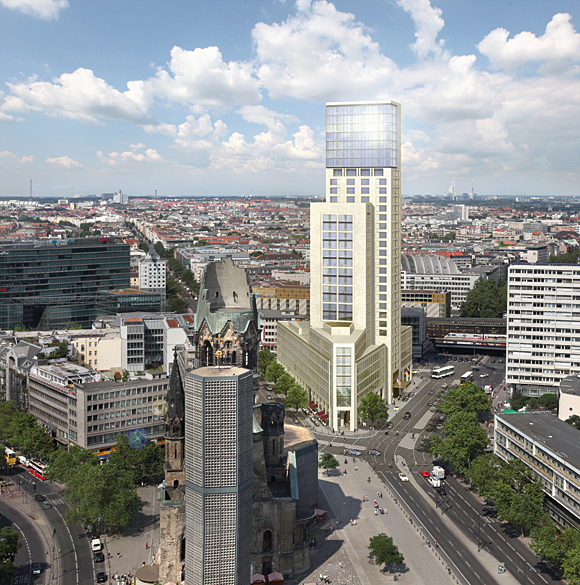 At the interface of Kurfürstendamm and the Zoological Garden, between the Theatre of the West, Hardenbergplatz and the KaDeWe superstore, the ZOOFESTER Tower forms a new landmark in the immediate neigh-bourhood of the Kaiser Wilhelm Memorial Church. Here you will find the urban quality of a European metrollpolis, with first-class infrastructure, lively residential quarters, shopping and restaurants and entertain-ment of an international standard. This part of Berlin is a shopper's paradise, a tourist magnet, a top address for education, culture and science and a highly popular place to live and work. In the immediate vicinity are the University of the Arts, the Chamber of Commerce and Industry and the Stock Exchange, the Supreme Court of Administration and the Technical University (TU).